The iP4850 is an absolute stunner. Print quality is exceptional and it's immensely fast. At the price, it's an absolute steal. How much do you really need to pay for a top-of-the-range printer? If you don't need options such as Wi-Fi connectivity, faxing and self-contained photocopying – offered in varying mixes by Lexmark's Impact S305, and Epson's PX720WD and WorkForce range – it might be less than you think. The new Canon iP4850 delivers spectacular performance for just £70. Taking over where the outgoing iP4700 left off, the latest model features a new set of pigment-based black ink, plus dye-based cyan, magenta, yellow and black inks that are tailored for top-quality document and photo printing. In fact, the actual inks remain the same, it's just the cartridges they come in are slightly different, with PGI-525 for pigment black and four CLI-526 cartridges for the dye-based inks. In most ways, the new iP4850 is near identical to the older iP4700, but that's no bad thing. It keeps the same dimensions at a remarkably compact 431 x 297 x 153mm (W x D x H). As with most other printers, the overall depth increases once you've extended the input and output trays to their full extension, but in this case to a still space-friendly 550mm. The input and output trays are also worthy of note here, since you get a 150-sheet cassette feeder that slots in underneath the printer, plus a full-size upright feeder at the rearm which can take a further 150 sheets of full A4-sized paper. The upright feeder is especially useful for loading with photo paper, meaning you don't have to keep swapping paper types every time you want to switch between document and photo printing. 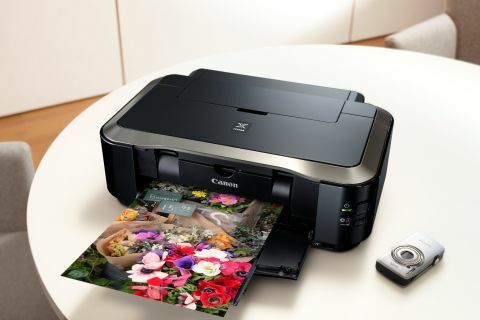 Some printers, such as the HP Photosmart Plus and Epson PX720WD, also feature a separate photo tray, but in both of those cases you only get a postcard-sized photo tray, which is no good for A4 photo printing. Many of Canon's older models included a paper feed switch on the front of the printer, but this has been scrapped on the iP4850. It actually helps avoid a bit of confusion, since the printer driver could overrule the paper feed switch anyway. Now, an automatic option selects the lower cassette for document printing and the rear tray for photo printing, but this can still be overridden in Printer Properties. Other finery includes auto duplex for double-sided printing, which is no mean feat on a printer this small. Better still, printing is as amazingly fast as the iP4700, outputting mono text pages in six seconds, colour DTP pages in 16 seconds, 6 x 4-inch normal quality photos in 19 seconds and full A4 borderless photo prints at the highest quality setting in two minutes flat. Document quality is impeccable and colour photo quality is absolutely stunning. The only thing that's second-best here is black-and-white photo printing, which can have a slight colour cast. To avoid this, you'd need to upgrade to Canon's PIXMA MG6150 all-in-one printer.